With the darkest days of winter over for another year and the evenings getting lighter, it gets us thinking about the paddle board adventures we can have over the warm summer evenings and weekends to come. When it is still cold outside, planning our spring and summer SUP trips makes us feel that we can almost feel the heat on our faces, so here are a few of the weekend paddle board expeditions we have planned in for summer 2015. There are plenty of opportunities to explore the old river, but the most tranquil section is upstream with the otters and kingfishers and far away from the busy stretches with the floating gin palaces. The river starts to becomes SUPable near Cricklade (not far from Swindon) and if you are starting here it’s better to come when the weeds are fewer and the water is deeper, in spring or early summer. Travelling on a river is all about going with the flow, which means travelling from point to point which introduces some tactical decisions. Not paddling out and back from a central base means that for a trip of any length, going with a friend and leaving a car at each end, while carrying kit on your board, is a good option. The perfect plan is to persuade a support driver to meet you at each stop and carry your baggage. To plan our Thames trip we used the website here . It has plenty of information about milage, riverside campsites and pubs and although it was put together a few years ago and worth double checking details, it’s a great starting point. We are really looking forward to our weekend on the Thames and finishing a sunny day of paddling with a drink in the Trout Inn, followed by a BBQ in a campsite by the river. The most spectacular scenery in England is the backdrop for this perfect SUP location, which has huge amounts of flat water to explore and plenty of places to stay, eat and drink. Lake Windermere is the largest lake in England and at ten miles long and one mile wide there is plenty to explore. It has shoreline camping and accomodation in the North but the main tourist centre is halfway down in Bowness On Windermere, with masses of hotels and guesthouses. Windermere and the neighbouring lake Coniston Water with its island, inspired the book ‘Swallows and Amazons’ and are both worth a paddle. Wastwater is the deepest of the sixteen lakes and with Scafell Pike (highest point in England) as a backdrop, it is a spectacular location for a paddleboard trip. You don’t need a permit to take to the water in most lakes, but in some you do and in others there are restrictions. Details here . While spectacular, the lakes aren’t known for their tropical temperatures, so dress for the water and keep yourself warm, on and off the board. Our hoodies are perfect for a post SUP warm down. Poole Harbour is a great place for SUPing because it’s sheltered, beautiful, unspoiled and full of wildlife. On the flip side, it is tidal and some areas can be busy, so check the tide and wind conditions before you go and always keep your eyes open. Central to the summer harbour experience is Brownsea Island, which was where Baden Powell started the scout movement and where the first scout camp was held. Today the island and its fantastic tea shop can be visited by SUP and for free by members of the National Trust. One side of Poole harbour is made up by the Isle of Purbeck which inspired the author Enid Blyton for her books about the adventures of the ‘Famous Five’ and in the spirit of ‘lashings of ginger beer’ we always choose to camp when we are exploring Poole Harbour. There are two ways to start a SUP adventure in Poole Harbour … one way (which we wouldn’t recommend) is with inflatable SUPs and lightweight camping gear. It is possible to catch the train to Poole station (direct line from London), carry your kit across the road and launch, but there is a short and risky route out into the main harbour through a busy working port. Our preferred option is to drive to the Redcliffe Farm Campsite (right by the river) or the nearby Ridge Farm Camping and Caravan Park (short portage) with our camping supplies and then launch directly into the River Frome. Trip options from the campsites depend on the strength and timing of the tide. 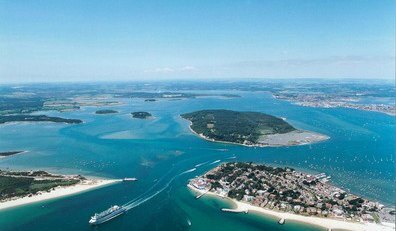 Either you could go for a short paddle up the River Frome or a longer one out into Poole Harbour and off to Brownsea Island. The nearby town of Wareham (which is within walking distance of the campsites) has pubs, restaurants and shops so you can finish your day with a couple of drinks, a good meal or supplies for a BBQ. Where are you SUP ing this summer? Where are the best places to spend a SUP weekend in Wales, Scotland and Ireland? Wherever you are in the world, we would love to hear what trips you are planning this year. Comment and inspire us, by sharing your plans, advice and paddle board expedition experiences right here.